Fairway Pines Assisted Living — Lyon Contracting, Inc.
Come experience all we have to offer. 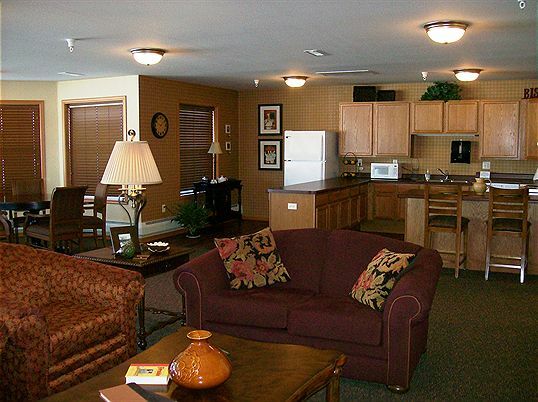 Fairway Pines is a 43-unit Assisted Living facility located in Sauk Centre, Minnesota, birth place of author Sinclair Lewis. It is located directly across the street from Sauk Centre Country Club, near the shores of Sauk Lake. Fairway Pines offers on-site licensed staff, a wide range of optional home services and Enhanced Memory Care services. Fairway Pines features many first class amenities such as a library with computer area, therapeutic whirlpool with massage area, beauty salon, health and fitness room, private dining area, arts and crafts room and a Great room with its own cooking area and general store. Each of the units includes their very own washer and dryers, kitchen appliances, individually controlled heat and A.C., nurse call system, window treatments and high-speed internet access.